But wait don’t feel too bad for the little guy…he doesn’t know it. In fact, I’m sure as far as Oskar is concerned everybody else is just like him. 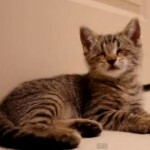 And besides Oskar found himself a Forever Home where his people and his “sibling” don’t care even one little bit that he doesn’t have fully-formed eyeballs. Besides, when you’ve got personality like that eyeballs shymballs…who the heck needs them anyway? Below is a video of Oskar the day after he came come from the adoption center with his new pet parents. He’s 8 weeks old and being introduced to his first toys. Now a kitten with a ball is simply adorable to begin with. 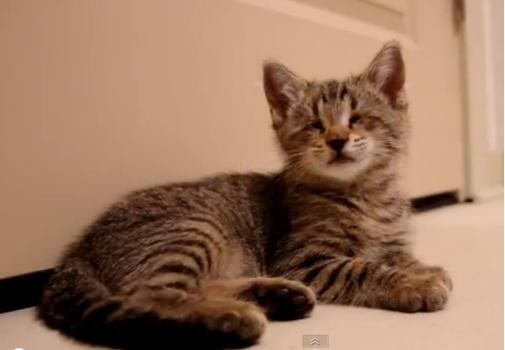 But a blind kitten discovering a ball for the first time is swoon-worthy adorable to the nth degree. It only takes Oskar a moment to figure out what that ball with a bell in its for and fun time begins.